1st Battery: At Culpepper [sic], Virginia with six 12-pdr Napoleons. The battery remained with the Artillery Brigade, Sixth Corps, Army of the Potomac. and Captain William H. McCartney remained in command. More precisely, the battery was with the corps near Stone-House Mountain, on the right end of the Federal deployment in Culpeper County at that time. 2nd Battery: No return. Captain Ormand F. Nims commanded this battery, assigned to Nineteenth Corps, Department of the Gulf. The battery may have retain six 6-pdr rifled field guns mentioned earlier in the year. Following the surrender of Port Hudson, the battery transferred to the corps artillery reserve (having been assigned to Fourth Division during the siege), and returned to Baton Rouge. At the end of September, the battery transferred again, this time to the Cavalry Division of the corps. The battery saw field service in the Teche Campaign later in the fall. 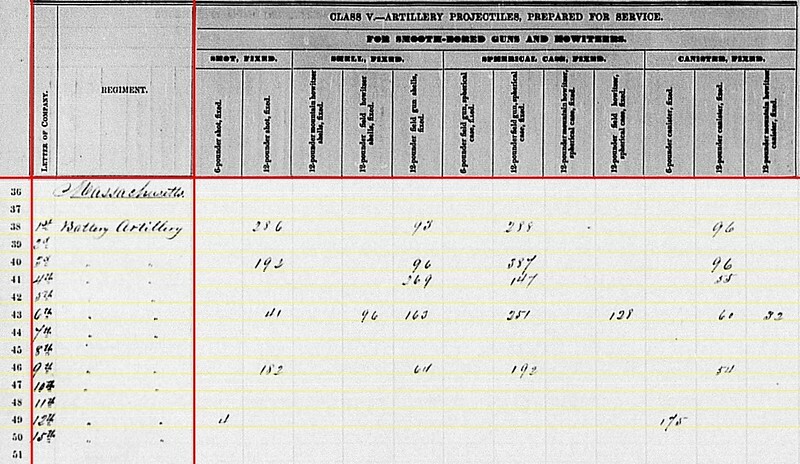 3rd Battery: Reporting at Warrenton Junction, Virginia with six 6-pdr field guns. This is obviously an error, as the battery held 12-pdr Napoleons (no batteries then assigned to the Army of the Potomac had 6-pdrs this late in the war). Assigned to the Artillery Brigade, Fifth Corps. With Captain Augustus Martin in command of the brigade, Lieutenant Aaron F. Walcott remained in charge of the battery. We might quibble over the location and say the battery was in Culpeper at the end of September. 4th Battery: Reporting from “Camin Grove Bayou” in Louisiana (a transcription I am struggling with). The battery had four 12-pdr Napoleons and two 3-inch ordnance rifles. Under Captain George G. Trull, the battery remained with Third Division, Nineteenth Corps. The battery moved around much during the summer and early fall with stays at Port Hudson, Donaldsonville, Baton Rouge. They were at Fort Brashear, outside Morgan City, Louisiana at the end of September. The battery would participate in the Teche Expedition in October. 5th Battery: Reporting at Centreville, Virginia with six 3-inch rifles. Captain Charles A. Phillips remained in command, and the battery assigned to the Fifth Corps. The location should be Culpeper, but reflects a later reporting date. 6th Battery: At Algiers, Louisiana with four 12-pdr Napoleons and two 12-pdr field howitzers. The battery was assigned to First Division, Nineteenth Corps, commanded by Captain William W. Carruth. When Carruth mustered out on October 3rd, Lieutenant Edward K. Russell (2nd Battery, above) transferred to command. Then in December, Lieutenant John F. Phelps, of the battery, took command. Phelps would be promoted to Captain with commission back dated to October 3. During their stay at Algiers, the battery was reequipped and reduced to four guns. 7th Battery: At Camp Barry, D.C., with six 3-inch Ordnance rifles. This battery had an eventful summer, though not one for winning battle streamers. Battery assigned to First Division, Seventh Army Corps, and commanded by Captain Phineas A. Davis at the start of the summer. At the start of July, the battery was among the forces employed for an expedition from White House to the South Anna River. On July 20, the battery was sent to Camp Marshall, in D.C. And from there dispatched by steamer to New York City, camping on Madison Square, to suppress the draft riots. On September 11, the battery returned to Washington, going to Camp Barry. Davis accepted a promotion, and left the battery to Lieutenant Newman W. Storer (who was soon made captain). 8th Battery: No return. Mustered out the previous November at the end of a six-month enlistment. 9th Battery: Culpeper, Virginia with four 12-pdr Napoleons. Remaining with the First Volunteer Artillery Brigade, Artillery Reserve, Captain John Bigelow commanded, but was recovering from wounds. Lieutenant Richard S. Milton filled in his place. 10th Battery: At Warrenton Junction, Virginia with six 3-inch Ordnance Rifles. When French’s Division came to the Army of the Potomac, the battery moved with its parent organization into Third Corps. Captain J. Henry Sleeper commanded. The location is presumably associated with the November date of return. At the end of September, the battery was with the corps, just west of Culpeper. 11th Battery: No return. This battery mustered out of service in May 1863. Though it did see some use suppressing draft riots in the mid-summer months. Captain Edward J. Jones commanded. The battery would muster back into service, under Jones, in January 1864. 12th Battery: At Port Hudson, Louisiana, with four 6-pdr field guns (down two 3-inch rifles from the previous quarter). Listed in the artillery reserve of the Nineteenth Corps. After serving by detachments during the Port Hudson campaign, the battery consolidated back in New Orleans in late July. It was stationed at Tivoli Circle (you know… were once a statue to a Confederate leader stood) at the end of September. Captain Jacob Miller remained in command. 13th Battery: Not listed. The 13th Battery suffered heavily in their first year of service. They’d lost sixty horses in the transit to New Orleans (that included a six week stay at Fort Monroe). And what horses they had when arriving at New Orleans were re-assigned to other batteries. Put to work on the Port Hudson siege lines, sickness and disease brought the battery down to fifty men by the end of August. At that time, Captain Charles H. J. Hamlin returned home to recruit more men. In his place, Lieutenant Ellis L. Motte was in command of a detachment, assigned to the 2nd Battery (above). 14th Battery: Not listed. Battery did not begin recruiting until January-February 1864. 15th Battery: At Bayou St. John, Louisiana with no reported artillery. Captain Timothy Pearson’s battery arrived in Louisiana in April. But their equipment and horses was re-allocated to other batteries at that time. The men served at posts around New Orleans as garrison artillery until the end of December. 16th Battery: Not listed. Battery did not begin recruiting until January-February 1864. 1st Battery: 286 shot, 93 shell, 288 case, and 96 canister for 12-pdr Napoleons. 4th Battery: 269 shell, 147 case, and 55 canister for 12-pdr Napoleon. 6th Battery: 41 shot, 163 shell, 251 case, and 60 canister for 12-pdr Napoleons; 96 shell, 128 case, and 32 canister for 12-pdr field howitzers. 9th Battery: 182 shot, 64 shell, 192 case, and 54 canister for 12-pdr Napoleons. 12th Battery: 4 shot and 175 canister for 6-pdr field guns. 4th Battery: 39 canister, 265 percussion shell, and 60 fuse shell for 3-inch rifles. 5th Battery: 138 canister for 3-inch rifles. 7th Battery: 120 canister, 236 percussion shell, and 120 fuse shell for 3-inch rifles. 10th Battery: 500 shot, 115 canister, 110 percussion shell, and 220 fuse shell for 3-inch rifles. 5th Battery: 140 shell and 930 case for 3-inch rifles. 7th Battery: 720 case for 3-inch rifles. 10th Battery: 15 shell and 240 case for 3-inch rifles. 1st Battery: Eight Navy revolvers, nine cavalry sabers, and five horse artillery sabers. 3rd Battery: One Army revolver, eight cavalry sabers, and twenty-four horse artillery sabers. 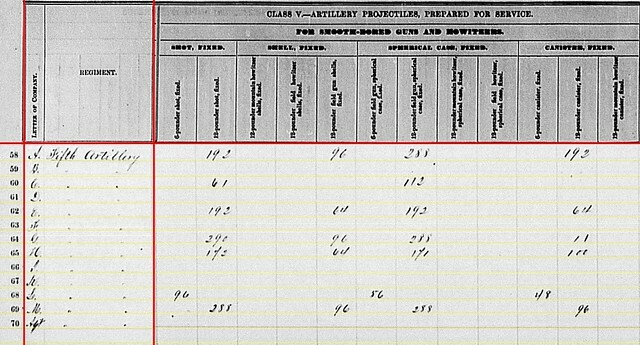 4th Battery: One breechloading carbine, seven Army revolvers, and thirty horse artillery sabers. 5th Battery: One Army revolver and twenty-seven horse artillery sabers. 6th Battery: Fourteen Army revolvers, ten Navy revolvers, and thirty (?) cavalry sabers. 7th Battery: Fifteen Navy revolvers and twenty-three horse artillery sabers. 9th Battery: Eight Army revolvers and ten horse artillery sabers. 10th Battery: Sixteen Navy revolvers and nineteen horse artillery sabers. 12th Battery: Eighteen Army revolvers and thirty-six (?) horse artillery sabers. 15th Battery: Fifty rifles (type unspecified), fourteen Navy revolvers, and twenty-two horse artillery sabers. We will discuss the Heavy Artillery from Massachusetts in a later post. But for now that’s the summary of the numbered batteries. At the start of July, Colonel (Brevet Brigadier-General) Harvey Brown commanded the regiment. An 1818 graduate of West Point, Brown served in the Black Hawk, Seminole, and Mexican American Wars. At the start of the Civil War, he turned down a volunteers commission with a star, opting instead for the colonelcy of the newly formed 5th US Artillery. For ten days (August 1 through 10), Lieutenant-Colonel George Nauman held temporary command. Colonel Henry S. Burton was formally named to command the 5th on August 11, thus completing the transition. An entry for every battery. And a line for the adjutant to boot! Battery A: At Portsmouth, Virginia with six 12-pdr Napoleons. Lieutenant James Gilliss’ battery remained with Getty’s Division, in the Department of Virginia and North Carolina. 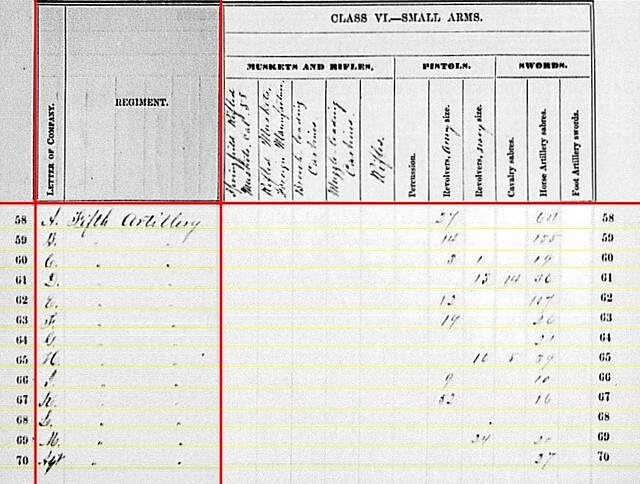 Battery B: Reporting at Martinsburg, West Virginia with six 3-inch Ordnance Rifles. Under Lieutenant Henry A. Du Pont, the battery was rushed to the Department of the Susquehanna during the Gettysburg Campaign. As the campaign closed, the battery remained as unassigned artillery in the Department of West Virginia. Battery C: At New York City, with six 12-pdr Napoleons. Though still allocated to the 1st Brigade of the Artillery Reserve, the battery was detached to New York after Gettysburg. Lieutenant Gulian V. Weir remained in command of this battery, though Captain Dunbar R. Ransom accompanied to command all artillery dispatched to quell the Draft Riot. By the end of September, the battery was at Camp Barry, Washington, D.C. Later in the fall, the battery rejoined the Army of the Potomac with Lieutenant Richard Metcalf in command (with Wier going to Battery L). Battery D: Reporting from Culpeper, Virginia with six 10-pdr Parrotts. Lieutenant Benjamin F. Rittenhouse remained at the post he assumed on July 2, after Lieutenant Charles Hazlett’s death at Little Round Top. The battery supported Fifth Corps. Battery E: At Chambersburg, Pennsylvania with six 12-pdr Napoleons. Lieutenant James W. Piper was in command. Dispatched in June to Pennsylvania, the battery remained in the Department of the Susquehanna. Battery F: At Warrenton, Virginia with six 10-pdr Parrotts. Lieutenant Leonard Martin remained in command this battery. The battery was assigned to Sixth Corps. Battery G: Port Hudson, Louisiana with six 12-pdr Napoleons. Lieutenant Jacob B. Rawles remained in command of this Nineteenth Corps battery. Battery H: At Chattanooga, Tennessee with four 12-pdr Napoleons and two 10-pdr Parrotts. This was “flip” from the previous quarter, but an accurate adjustment of the records. Captain George A. Kensel became artillery cheif for First Division, Fourteenth Corps. In his place Lieutenant Howard M. Burnham commanded. Burnham was killed when the battery was overrun on September 19. 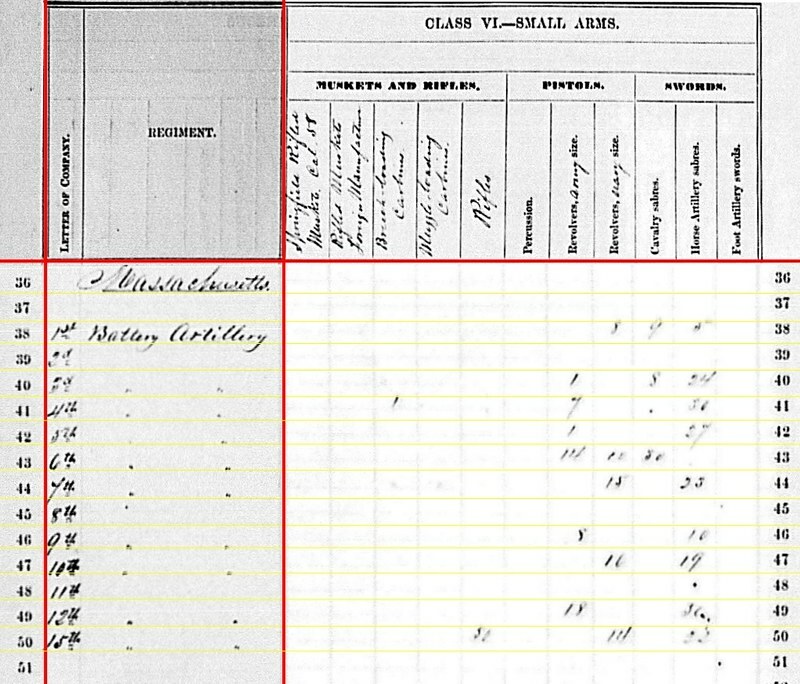 Lieutenant Joshua A. Fessenden stood in his place. At Chickamauga, the battery lost two officers, 25 men, battery wagon, forge, and all their caissons. Refitting in Chattanooga, the battery had sufficient limbers and caissons for the Napoleons, but only enough limbers for one Parrott. Battery I: Reporting at Camp Marshall, D.C. with four 3-inch Ordnance Rifles. Lieutenant Charles C. MacConnell remained in command of this battery, which was transferred from the Army of the Potomac for refitting and replacements. Most references indicate the battery was assigned to Camp Barry. And at least for a month Battery I was combined with Battery L for training. In November, the battery was combined with Battery C.
Battery K: At Chattanooga, Tennessee with four 12-pdr Napoleons. Lieutenant David H. Kinzie, remained in command. The battery transferred, with the rest of the Twelfth Corps, from Virginia to Tennessee in October. Battery M: At Stonehouse Mountain, Virginia with six 12-pdr Napoleons. Captain James McKnight’s battery transferred from Yorktown to the Sixth Corps, Army of the Potomac, in late July 1863. I like this placename, as it prompts me to search through correspondence with Bud Hall. Stone House Mountain (note the space) appears on Captain William H. Paine’s excellent map of the Culpeper area. It is close to Griffinsburg, west of Culpeper Courthouse. Adjutant: Reported from Fort Hamilton, were the headquarters was located. I’d like to put a name to this line. Lieutenant Henry A. Dupont had been the regimental adjutant up until July, when he took command of Battery B. 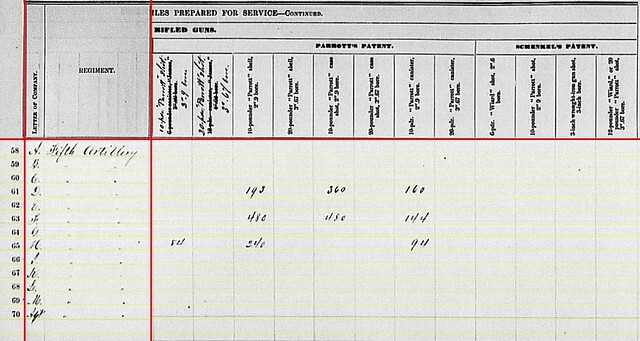 However, Heitman’s Register indicates he was still officially the adjutant. Lieutenant Thomson P. McElrath was the regimental quartermaster, and also appeared on correspondence from August and September 1863 as adjutant. Overall, these are the cleanest set of administrative details and reported cannon from any regimental summary thus far. Battery A: 192 shot, 96 shell, 288 case, and 192 canister for 12-pdr Napoleons. Battery C: 61 shot and 112 case for 12-pdr Napoleons. Battery E: 192 shot, 64 shell, 192 case, and 64 canister for 12-pdr Napoleons. Battery G: 290 shot, 96 shell, 288 case, and 11(?) canister for 12-pdr Napoleons. Battery H: 142(?) shot, 64 shell, 171(?) case, and 100 canister for 12-pdr Napoleons. Battery L: 96 shot, 56 case, and 48 canister for 6-pdr field guns. Battery M: 288 shot, 96 shell, 288 case, and 96 canister for 12-pdr Napoleons. Battery B: 209 canister, 296 percussion shell, and 164 fuse shell for 3-inch rifles. Battery I: 50 canister for 3-inch rifles. Battery D: 193 shell, 360 case, and 160 canister for 10-pdr Parrott. Battery F: 480 shell, 480 case, and 144 canister for 10-pdr Parrott. Battery H: 54 shot, 240 shell, and 94 canister for 10-pdr Parrott. Battery B: 221(?) shell and 513 case for 3-inch rifles. Battery D: 599 shell for 10-pdr Parrotts. Battery F: 120 shell for 10-pdr Parrotts. Battery I: 318 case for 3-inch rifles. Battery A: Twenty-seven Army revolvers and sixty-four horse artillery sabers. Battery B: Fourteen Army revolvers and 135 horse artillery sabers. Battery C: Three Army revolvers, one Navy revolver, and nineteen horse artillery sabers. Battery D: Thirteen Navy revolvers, fourteen cavalry sabers, and thirty-six horse artillery sabers. Battery E: Twelve Army revolvers and 107 horse artillery sabers. Battery F: Nineteen Army revolvers and twenty-six horse artillery sabers. Battery G: Twenty-one (?) horse artillery sabers. Battery H: Sixteen Navy revolvers, eight cavalry sabers, and thirty-nine horse artillery sabers. Battery I: Nine Army revolvers and ten horse artillery sabers. Battery K: Fifty-two Army revolvers and sixteen horse artillery sabers. Battery L: Nothing….. for the second straight quarter. Battery M: Twenty-four Navy revolvers and twenty horse artillery sabers. Adjutant: Twenty-seven horse artillery sabers. In addition, the adjutant reported six nose bags, twenty-seven saber belts, eight bridles, five currycombs, six girths, six halters, five horse brushes, five lariats, four picket pins, six Model 1859 pattern saddles, six sweat-leathers, two surcingles, six artillery-type saddle blankets, six sets of spurs, and six screw-drivers. And as mentioned above, Lieutenant P. McElrath was likely the officer accounting for those items – either as the adjutant or the quartermaster. And once again…. all government property was accounted for.